Daikin’s range of Rooftop Packaged Units has been developed specifically to suit commercial applications and are designed for flexible and easy installation. Along with the light cream colour, the flat top and compact design gives an aesthetic and neat appearance when installed in the line of sight. The durable powder coated sheet metal and corrosion resistant fixings make this unit ideal for the harsh Australian climate. Fixed base beams provide a rigid foundation for the entire rooftop packaged unit. Designed for easy installation as well as exceptional performance, the base beam has integrated forklift slots and pre-drilled rigging holes. It is also designed to allow mounting on a roof curb, with detailed guidelines for dimension of the roof curb requirements provided in the installation manual. 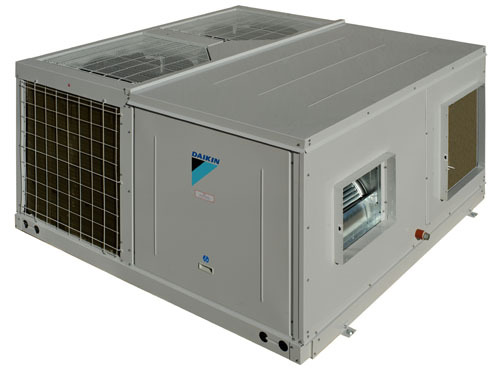 All Daikin Rooftop Package Units feature a belt driven supply air fan, with a variable pitch pulley to deliver a wide range of supply air volumes and external static pressures. Servicing of supply air fan motors, pulleys and belts can be all be carried out on site, minimizing downtime and simplifying routine and unplanned maintenance. Daikin Rooftop Package Units can be easily converted from horizontal to vertical (downward) supply and return air duct configuration by relocating the panels and supply air fan mounting. The sheet metal condensate drain pain is powder coated for corrosion resistance. A 50mm filter slot is provided as standard in instances where a field supplied filter is required. 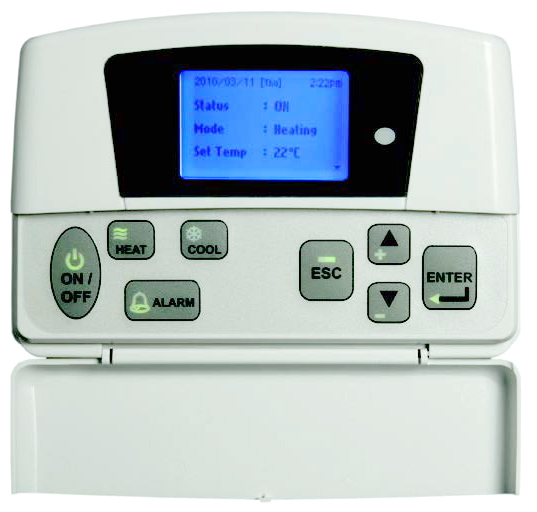 Daikin’s UAYQ-C series Rooftop Packaged Units have been developed to provide air conditioning solutions that are energy efficient, simple to use and reliable, ensuring full compliance with MEPS requirements. Daikin Rooftop Package Units use propeller type Condenser Fan and Motor Fans, direct driven by weatherproof electrical induction motors. Condenser fan motors have class F insulation and splash-proof enclosures. The condenser and evaporator coils are manufactured from seamless inner grooved copper tubes mechanically bonded to aluminium fins for optimum heat transfer. All coils are Nitrogen pressure tested to 4.2 MPa and are further leak tested with Helium at 1.6 MPa. To improve their corrosion resistance, a Hydrophilic Gold Fin is provided as standard. The UAYQ-C series casing is made of zinc coated galvanized steel sheets which are powder coated to provide a durable weather resistant finish to withstand the harsh Australian climate and provide minimal visual impact when installed in line of sight. All fasteners are zinc plated for corrosion resistance and superior durability. To prevent the likelihood of condensation forming inside the casing, Daikin Rooftop Packaged Units are equipped with 10mm Polyethylene panel insulation throughout. Daikin Rooftop Packaged Units use a belt driven, double width double inlet (DWDI) centrifugal forward curved evaporator fan. In conjunction with the factory fitted Variable Pitch Pulley (VPP), this evaporator fan allows the unit to deliver a wide range of airflows and external static pressures. For precise control of refrigerant flow, the UAYQ-C series is equipped with an Electronic Expansion Valve (EEV). Compressor used in UAYQ-C series Packaged Units are hermetically sealed scroll type. All compressors are fitted with an internal overload protection to protect your investment. Download the latest Rooftop Packaged Systems Brochure for more information. If you are a registered commercial user or a Daikin Dealer, you also have access to a full range of technical and support materials, including Engineering Data, Service and Installation Manuals via the Daikin Secure Portal.